A Wigan man who entered a stranger’s flat and threw plates at him has been given a 12-month community order. Dylan Bromley got into Daniel Keyworth’s home on Upper Dicconson Street, Swinley, and verbally abused him before taking crockery from a draining board and launching it at him. 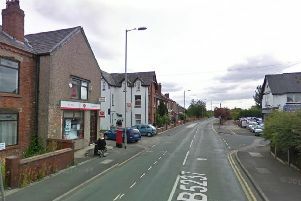 However, the 21-year-old, of Stoneyhurst Avenue, Ince, missed and smashed a window. Wigan justices heard a row broke out after neighbour Matt Winstanley knocked at Mr Keyworth’s door with a bloodied nose, asking for help. Prosecuting, Tess Kenyon said: "Mr Keyworth, concerned for his well-being, went down to another apartment which was pointed out to him. "They came across the defendant, who tried to kick Mr Keyworth in the face, but he managed to block it before being rugby-tackled. "Mr Keyworth was continually receiving verbal abuse during this scuffle, but got back to his feet eventually and went back to his flat." Later Bromley entered the flat uninvited, where he tried to provoke into Mr Bullough into a fight. When the victim refused, the plates were thrown. Bromley was then locked out while police were called, but kicked the door and continued to hurl abuse. Bromley admitted criminal damage and two counts of using threatening behaviour. His community order requires 100 hours’ unpaid work and he must also pay a surcharge and costs of £170.